Five states will expand Medicaid in 2019. Fourteen may start requiring Medicaid enrollees to work in return for their health coverage. And a new study could help all of these states understand what might be in store under these policies. Conducted by the University of Michigan Institute for Healthcare Policy and Innovation, the study finds that nearly half of people covered by Michigan's expanded Medicaid program felt their physical health improved in the first year or two after they enrolled in the program. More than a third said their mental or dental health had improved. These self-reported improvements in health occurred earlier than had been seen in studies in other states. Meanwhile, nearly half of those surveyed were working, though they earned less than the near-poverty-level wages needed to qualify for Healthy Michigan Plan coverage. Nearly half of those who reported they were employed also had at least one chronic medical condition. Of those who were employed, more than two-thirds said having Healthy Michigan Plan coverage had helped them do a better job at work. And more than a third of those who had changed jobs in the last year said Healthy Michigan Plan coverage helped them get a better job. Those who said their health improved due to their new coverage were four times as likely to say that they were doing a better job at work. And those who had a chronic condition were more likely to say that they were doing a better job at work since getting covered. Another quarter of the respondents were out of work when they took the telephone survey—yet more than half of them said their Healthy Michigan Plan coverage improved their ability to look for a job. Those who were age 51 and over were especially likely to say this. The study, published in the Journal of General Internal Medicine, is based on a survey of 4,090 people enrolled in Healthy Michigan who answered questions by telephone about their knowledge and experiences with the program and the impact it had on their health and lives. The paper also includes responses from in-depth interviews with 67 Healthy Michigan Plan enrollees who described in detail the impact of their coverage. They spoke of being able to get care for issues such as back pain, mental health conditions, and oral health problems that had interfered with their ability to work. "What's interesting is that people reported palpable impacts on their health so quickly—usually this can take years to happen," says Renuka Tipirneni, M.D., M.Sc., lead author of the new study and an assistant professor of internal medicine at U-M. "When we looked at that in more detail, what we noticed was that enrollees who reported those health improvements were three to four times more likely to report that they were either better able to do a good job at work or better able to seek a job." Eighty percent of those surveyed had incomes below the federal poverty level for their household at the time they took the survey in 2016; this was equivalent to about $12,000 for an individual at the time. The rest had incomes less than 133 percent of the federal poverty level, which varies depending on household size. Even those working close to full-time at minimum wage may qualify for the Healthy Michigan Plan. Tipirneni and her colleagues say their findings have implications for states like Virginia, Utah and Idaho that are poised to expand Medicaid in 2019, and for states that have sought permission from the federal Centers for Medicare & Medicaid Services to add a work or community engagement requirement to their existing Medicaid expansion program. "Our survey shows that a large portion of enrollees who have chronic illnesses or poor health are already working—this has many implications for the way we structure Medicaid programs," says Tipirneni, a general internist who sees patients at Michigan Medicine, U-M's academic medical center. She notes that even one-third of people who said they were in fair or poor health were still managing to work despite their physical or mental health challenges. "Proponents of work requirements have stated they are looking for a positive impact on society by encouraging people to work or contribute to society in other ways," she says. "What we're seeing from our data is that this new insurance coverage itself is having positive effects on enrollees' health and work." Arkansas was the first state to require Medicaid expansion enrollees to document that they are working or engaged in other activities. Recent data suggest that failure to meet the program's work-hour reporting requirements resulted in thousands of enrollees losing their coverage. Michigan and other states have asked for permission to require some or all Medicaid enrollees to work. Says Tipirneni, "We hope that states can use data from this and prior studies to consider the potential costs and benefits of work requirements in Medicaid." Tipirneni and colleagues recently published recommendations in the New England Journal of Medicine for how states could design such programs without creating undue risk that people with chronic illnesses would lose continuous coverage, and to help health care providers navigate their role in documenting which patients should be medically exempt from a work requirement. 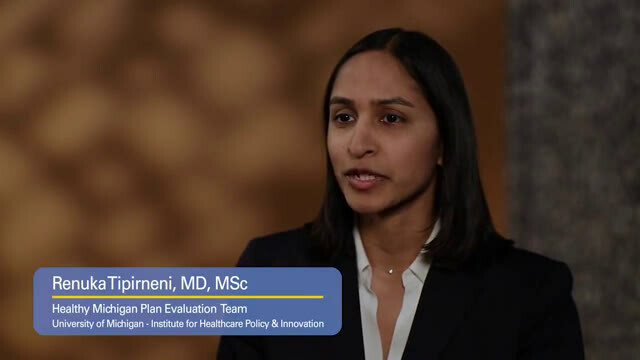 Tipirneni and her colleagues conducted the survey of a representative sample of Healthy Michigan Plan enrollees, and detailed structured interviews with 67 participants, in 2015 and 2016 as part of the official federally mandated evaluation of the program. The survey was conducted with enrollees in their choice of English, Spanish or Arabic. IHPI holds a contract with the Michigan Department of Health and Human Services to carry out that evaluation, and this study expands on that work. In all, over 650,000 Michigan residents are covered by the Healthy Michigan Plan.